J.K. Rowling has pulled her own short-lived “Richard Bachman.” Richard Bachman is the pseudonym that Stephen King wrote seven books under before his true authorship was revealed—not by an anonymous tip but by a shrewd reader who recognized the master’s hand. What is interesting to me about the J.K. Rowling story, featured in the New York Times, is that in-spite of having what must have been the enthusiastic support of “his” publishing house, publicist, and what I can only imagine must be a stellar literary agent, with reviews that would make any author’s heart Electric Slide with joy, “Robert Galbraith” sold 500* books. I am not putting that amount down. I should be so lucky and hope to be. It is EXCELLENT for us mere mortals, but it certainly is not J.K. Rowling standards. I am happy for her that anonymously she garnered critical acclaim, but is a good book not good enough? Author Patrick Wensink’s candid essay My Amazon Bestseller Made Me Nothing revealed that his book sales of 4000 copies did not make him any money. Do you need to be already famous to succeed? It would seem that literary success can’t be measured only by copies sold or profits banked. J.K. Rowling found success in the freedom to create and be evaluated apart from her fame. I find that situation far from being discouraging, but rather, one in which a writer can challenge herself and perhaps even succeed on her own terms. *a correction from the original amount of 1500 which was the hardcover print run and not the actual number of books sold. 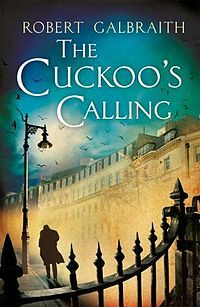 This entry was posted in publishing and tagged books, j.k. rowling, literary success, literature, publishing, richard bachman, robert galbraith, success, writing by stephanie roberts. Bookmark the permalink. Sales have skyrocketed, and it turns out that 1500 was the hardcover print run the book itself sold around 500 copies before Rowling was revealed to be the true author. I am still calling that respectable considering the average book sells 50 copies in its lifetime, and Robert Galbraith was a debut author. Thank you for your comment Lois. I also think it is encouraging to others who are writers. It will be interesting to see how sales go now that the true author’s name is known. Will they skyrocket ? Have they already done so ? Thank you for your comment Siobhan. I would like to add perseverance to your list something J.K. Rowling has also demonstrated. This is one of the most reasonable commentaries I’ve read on this. I think this story shows that there are just so many talented authors out there, and it takes luck as much as skill and good support from the publishers to achieve best seller status.